#WontBeErased: Trans Activists To Rally Against Trump - Joe.My.God. Activists in the L.G.B.T. community mobilized a fast and fierce campaign on Sunday to say transgender people cannot be expunged from society, in response to an unreleased Trump administration memo that proposes a strict definition of gender based on a person’s genitalia at birth. The existence of the memo, the administration’s latest effort to roll back the recognition and protection of transgender people under federal civil rights law, was reported by The New York Times on Sunday morning. Within hours, the hashtag #WontBeErased circulated on social media. By Sunday evening, a rally for transgender rights took place in New York; another was planned for Monday in Washington. The new definition would essentially eradicate federal recognition of the estimated 1.4 million Americans who recognize themselves as a gender other than the one they were assigned at birth. On Sunday night, several hundred people gathered in Washington Square Park in New York to protest against the proposal, joining thousands of others who posted their condemnation and pictures of themselves to social media under the hashtag #WontBeErased. 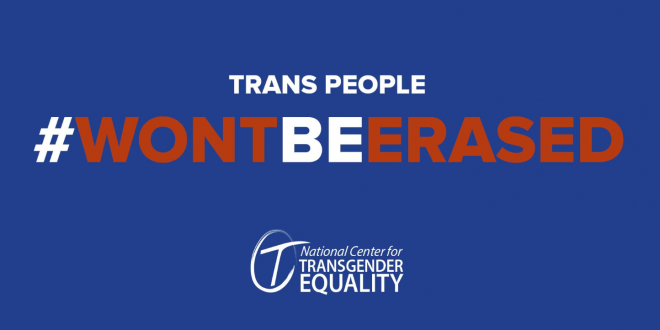 The National Center for Transgender Equality NCTE) has called for a demonstration in Washington DC to gather at Pennsylvania Avenue at 12.30pm local time (1730 BST) before marching to the White House. “They are saying we don’t exist,” said Mara Keisling, the NCTE director, who described the government’s proposed reform as a “super-aggressive, dismissive, dangerous move”.